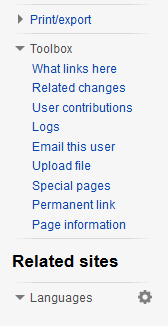 Somewhere in the past the level of the headings in the sidebar changed. Both levels were supported for a period of time but now the CSS that made them looking the same was removed. bzimport set Reference to bz51517. Well, if you don't mind, I try this one myself. What a hassle for such a simple correction.... There should be a web interface for editing and committing. Hi, sorry for the hassle again, but would you mind doing the same for RelatedArticles and Insider?